With the emergence of service-oriented architecture (SOA), the options for accessing the existing IBM Customer Information Control System (CICS) assets have become more varied than ever. With this variety comes the complexity of securing these assets. 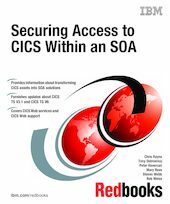 This IBM Redbooks publication is intended for IT architects who are involved in the process of selecting, planning, and designing a secure SOA solution that makes use of CICS assets. This book introduces SOA and the options available for transforming CICS assets into SOA solutions. It then discusses the principles of security, followed by the different security technologies. The book then reviews each technology individually, discussing the security options that are available, the security architectures such as basic authentication, firewalls, and the use of Secure Sockets Layer (SSL) and public key infrastructure (PKI).